On the surface, Apple’s $1 billion investment in Chinese ride-sharing company Didi Chuxing makes little sense. Apple typically doesn’t invest in startup companies, preferring to develop its own products. The investment also differs from past tie-ups such as Beats Electronics—Apple seemingly has no direct interest in ride-sharing. The company’s $1 billion investment—inconsequential compared to its $230 billion cash balance—isn’t about Didi, it’s about Apple’s own future. As doubts about global growth of the iPhone emerge, this investment reveals much about the direction Chief Executive Tim Cook is looking to take the company. As China’s leading ride-sharing company, Didi Chuxing (formerly known as Didi Kuaidi) is already crushing its main rival Uber China. Didi last year raised $4 billion in secured funding and is currently valued at $15 billion. Uber China is valued much less, at about $8 billion following a $1.2 billion funding round earlier this year. Leading Chinese Internet giants Alibaba Group Holding Ltd. and Tencent Holdings Ltd. are both investors in Didi. 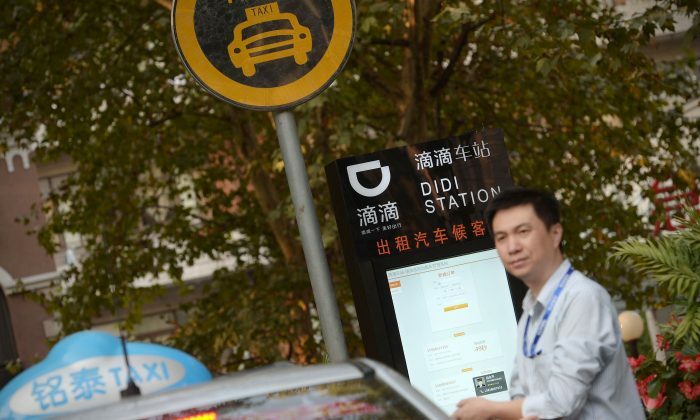 While third-party data is scarce, Didi claims 11 million rides per day in China compared to Uber China’s 1 million rides, giving the company a derived 90 percent market share in ride-sharing. Put differently, Didi doesn’t need Apple’s money. Apple’s gambit is about keeping its foothold in China and staying relevant. Thanks to the popularity of iPhone, China has become Apple’s second-biggest market after the United States, generating almost 25 percent of top-line revenue. But that position is eroding as Chinese demand for the iPhone shrinks. After double- and triple-digit annual growths during the last five years, sales of smartphones grew just 2 percent in 2015. Apple has long prepared for this, however, by pushing lucrative media services such as Apple Music, Apple TV, and its iTunes Store. Hundreds of millions of iPhones, iPads, and Mac computers are out there—the logical next step is to take a strategy from Amazon.com’s playbook and push digital media consumption. ITunes and iBooks stores in China were shut down by Chinese authorities. But its prospects in China already look grim on that front. Last month, Apple confirmed that its iTunes and iBooks stores in China were shut down by Chinese authorities, after only six months of operation. Apple’s support of Didi—in opposition to its Silicon Valley neighbor Uber—is a gambit of symbolic appeasement to Chinese authorities. In putting money on the Beijing’s preferred horse in the ride-sharing race, Apple aims to keep its relevancy in a market indispensable to its future success. Keeping China in its good graces is a shorter term play for Apple. Longer term, the Didi investment can pay dividends as Apple looks towards the next technology arms race—autonomous driving. Most major automakers are invested. Alphabet and Fiat Chrysler Automobiles NV recently formed a partnership to experiment with Google’s self-driving technology in Chrysler minivans. General Motors Co. and Lyft are working on a fleet of driver-less taxis. Tesla already incorporates some hand- and foot-free driving features in its Model S sedan. The Didi investment all but confirms Apple’s ambitions in the future of driving. Long an open secret in Cupertino, Apple has been working on driver-less vehicle technology for years. People familiar with the company’s plans told the Wall Street Journal that Apple has been recruiting from technology and automotive companies, and the project now involves more than 1,000 employees at the firm. For now, Apple can use the troves of data from Didi to examine driver behavior and traffic patterns, augmenting its existing assets in mapping and artificial intelligence to deploy in any future driver-less car technology. Apple shares have declined 14 percent year-to-date and 29 percent in the last twelve months on concerns about growth, specifically demand for its iPhone. A recent Nikkei report stated that Taiwan-based component makers are getting “significantly fewer orders from Apple in the second half of the year compared with a year ago,” alluding to possibly dampened demand for the upcoming iPhone 7 in the second-half of 2016. Growth therefore could come in the form of future technologies outside of its traditional business. While it’s unusual for Apple to participate in a fundraising round for a startup, the Didi investment signals more activity in this space going forward. But that could be changing. Cook recently hailed the strength of Apple’s balance sheet, including its $230 billion cash war chest. In a Wall Street Journal report in January, Cook said the company’s cash balance is “worth more” during periods of economic distress for startups as valuations drop and funding tightens. An anti-counterfeiting group is suspending Chinese e-commerce giant Alibaba from its group after backlash from companies on May 13.